This wonderful relaxing technique is a deep tissue massage performed using my feet. The Ashiatsu BareSole Massage uses deep compression effleurage strokes utilizing gravity force in a gliding motion. It provides deep relaxation while stimulating circulatory and lymphatic system of the body. Treatment helps relieve muscle pain, increases range of motion and flexibility and creates a state of well-being. Deep compression feels good, not painful. Regular treatments can help with increase mobility and stamina of muscles and helps to improve posture. Using calming oils suitable for pregnancy with special techniques, this treatment will leave you stress and pain free. Reflexology is a relaxing complementary therapy using specialized massage pressure movements. It is based on a theory that the feet and hands represent a map of the body. The aims of Reflexology is to create balance, harmony and wellbeing in a holistic approach throughout mind, body and spirit, stimulating the body’s own healing process. Add Hot stones to the feet and lower legs , or hands during a Reflexology treatment. The combination of Reflexology and the heat of the hot stones really does take relaxation to another level. Hot Stone massage originated in India and China and has been around for centuries; ancient civilizations believed that hot stones cleansed the body and relaxed the heart, grounding the soul and soothing the mind. The subtle energies of the stones introduced into a treatment calm the senses, relax muscle tension and promote a meditative state. The heat from the stones penetrates to a deeper level and may reach up to 7-8cms into the superficial layer of muscle; bringing about physiological changes as well as influencing the body’s internal energy flow (chi) therefore bringing balance to both body and mind. Hot stones have been shown to lower cortisol levels and help to support the parasympathetic nervous system to help the body reverse the stress reaction. Reflexology and hot stones are a perfect way to nurture our bodies. Janssen Cosmetics is a cosmeceutical care system based on multiple, highly-effective active substances tailored to a specific skin type and achieves both visible and measurable results. Cosmeceuticals do not act exclusively on the surface of the skin but achieve an effect deep down in the skin. Do you feel tired and stressed and this is reflected in your skin? We can help by rejuvenating, revitalising, hydrating your skin no matter what your skin type or age using rich cream or gel masks, complex’s and facial exfoliants. For clearer, smoother, more supple and lifted skin with refined pores, the application of a customised firm setting Phytogen Mask, active ampoule concentrate and enzymatic deep peeling is perfect. For long lasting hydration, anti-aging, hypersensitivity and visible reduction of small lines together. Enzymatic or gentle acid peeling, followed by concentrated ampoule and serum. Application of a Collagen Fleece, without perfume oils or preservative. Used to enhance and boost the skin, each ampoule is a remarkable moisturizer and moisture binder containing long chain hyaluronic acid plus additional benefits of special added ingredients to boost metabolic stimulation within the skin cells. Extraordinary gel pre mask producing visibly reddened skin, removing toxins and deeply stimulates metabolism. Neck and upper chest firming treatment for prematurely aged or sun damaged skin that has lost elasticity and hydration. Cleansing of the face and neck followed by an Essential Oil massage using gentle massage techniques for precise stimulation of reflex points, nerve points and zones on the face and scalp, opening up the energy channels throughout the body. You may have heard of foot or hand Reflexology. Facial Reflexology works on the same principles, This non-invasive treatment is based on theory that areas on your face are connected to areas of your body, and stimulating them improves underlying energy imbalances which promotes well-being. The proximity of the face to the brain is key to the effectiveness of this original therapy. A complete mind,body and soul treatment using hot and cold volcanic basalt stones bathed in fragrant oils that penetrate very deeply into muscles and bones, aiding relaxation, relieving stress & tension & balancing energy levels. Micro fine particles of walnut shell gently polish to reveal smoother, fresher skin and papaya enzymes detach dull dead skin and stimulate renewal. 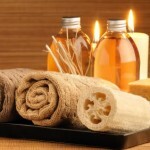 Hot lemon compress is followed by a massage using essential oils. A stimulating but relaxing head and shoulder massage using special pressure techniques.Good for headaches,tension, sinus problems and stress. A massage that incorporates shiatsu, reflexology & Chinese massage. By manipulating the 10 major energy lines, the mind & body are stimulated to restore the balance in that particular area. Removal of unwanted hair using disposable sterile needles. Using jasmine oil paraffin wax,renowned for its therapeutic benefits in helping with dry skin and arthritis. An ancient art of removing hair using 100% anti bacterial cotton thread. Please feel free to visit/call me (SAM) to discuss these or the vast range of other treatments. I will only be too pleased to advise you. It costs you nothing to receive good, honest professional advice.